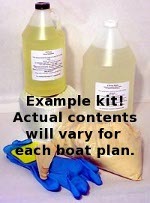 The epoxy-fiberglass kits do not include the plans or the plywood! The kits include all the epoxy and fiberglass listed in our Bill Of Materials. Our MarinEpoxy Resin is a high performance marine resin specially formulated for our building method. It has a low viscosity and is ideal for fiberglass lamination. It wets the fiberglass evenly and fast. The mixing ratio is simple: one volume of hardener for two volumes of resin. To make putty and glue, mix the resin with the fillers supplied in the kit. Add filler to reach a ketchup like viscosity for glue, add more fillers to a peanut butter consistency for fillets and putty. For information on how to use resin and fiberglass please visit our technical support web site bateau2.com. No need to search all around town or to compare prices with generic epoxies: our kits prices are lower and include shipping in the US!